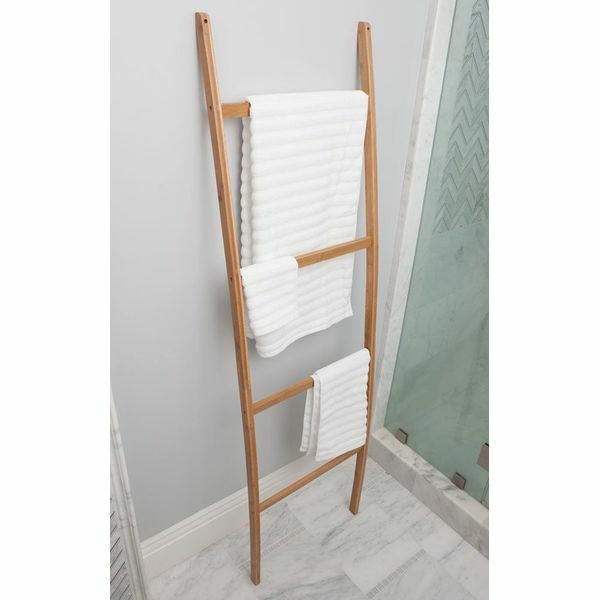 Keep your towels within easy reach without creating an eyesore in your bathroom with this Bamboo Towel Ladder. 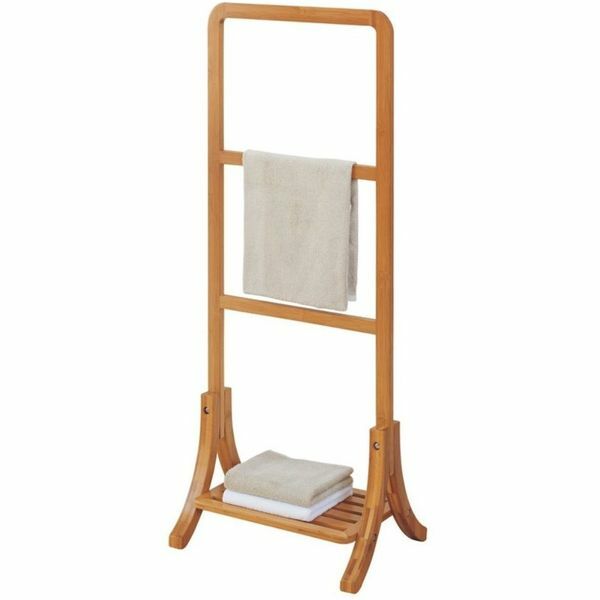 The towel ladder is made from bamboo material that has a natural light stain. There are four different rungs for you to hang the towels on, and it is easy to lean against the wall. This one’s a beauty! This amazing new bamboo towel shelf has space not only for your towels, but also assorted hand towels, sponges, soap bars, and practically anything else you can think of! Thanks to its no-brainer construction design, it will hang directly on to your bathroom wall (or any wall in your house, for that matter) and will guarantee you plenty of extra shelf space when you need it. Excellent for when unsolicited relatives or BFF’s show up at your door, needing a shower. Comes with full manufacturer’s warranty. Store your towels while adding detail to your bathroom with this Freestanding Chrome Plated 3-Tier Bamboo Towel Bar. The towel bar features bamboo tops that are supported by metal bars, the combination of which provides you with a timeless look. The bar measures 33.3 inches by 17.7 inches by 8.5 inches in size. Looks sort of like clothespins, or Chinese chop sticks, doesn’t it? But, rest assured, this nifty new bamboo towel rack design will bring a touch of exotic Far Eastern (like China and stuff) elegance and grace to your humble abode. It’s got three extending arms which can be folded back for storage when not in use. But when you’re ready to open up the throttle on this baby and really let ‘er rip, she’ll store three towels faster than you can light off a bottle rocket. Seriously, this hot Asian vixen cooks, is bad to the bone, and keeps her engine clean. Well, not much to say about this one. 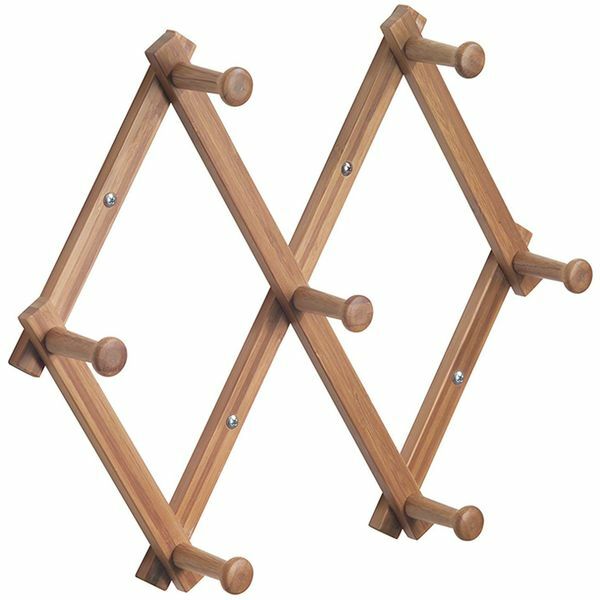 The Organize It All Lohas bamboo ladder towel rack resembles a folding chair, but doesn’t actually fold. What it will do is store your bath towels effortlessly on its upper and lower racks, and store a dozen more on its handy lower shelf! It will basically organize all your bathroom, beach, and household towels, and plenty more of your essential bath and shower accessories to boot. Fine bamboo finish on a pleasing, unobtrusive body. Easy assembly. Comes with manufacturer’s warranty. This all natural bamboo towel rack design has been specially noted by its manufacturer as a “renewable resource”, presumably due to its…all natural bamboo construction. It’s another of these wall hanging clothespin designs, and if you’re fond of that sort of thing, this is the one for you. It’ll hold quite a large number of towels, actually, and is certainly portable and movable to other rooms in your home. Comes with assembly instructions, but you’d have to be a functionally disabled chimpanzee not to be able to figure it out. 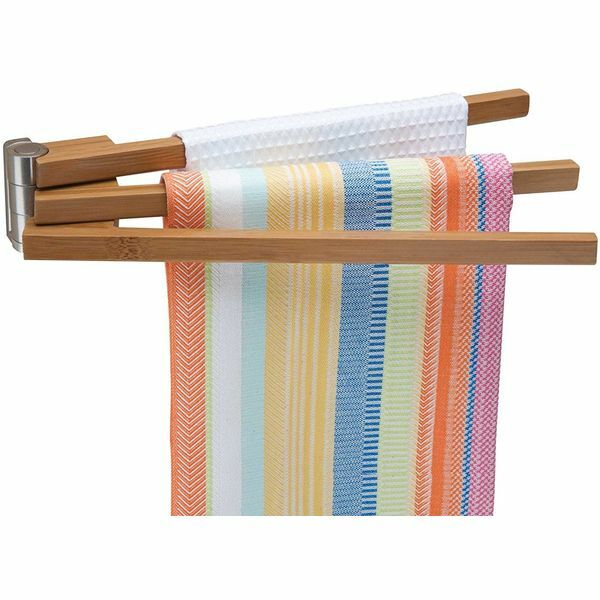 Keep your towels within reach without them making a mess with this Bamboo Wood & Stainless Steel Over the Door Towel Rack. 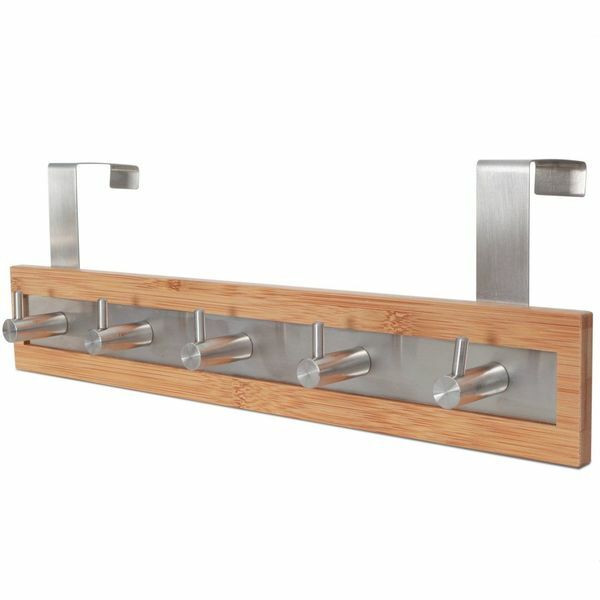 The towel rack can sit atop any door and will allow you to hang up to five towels for storage or to dry off after use. 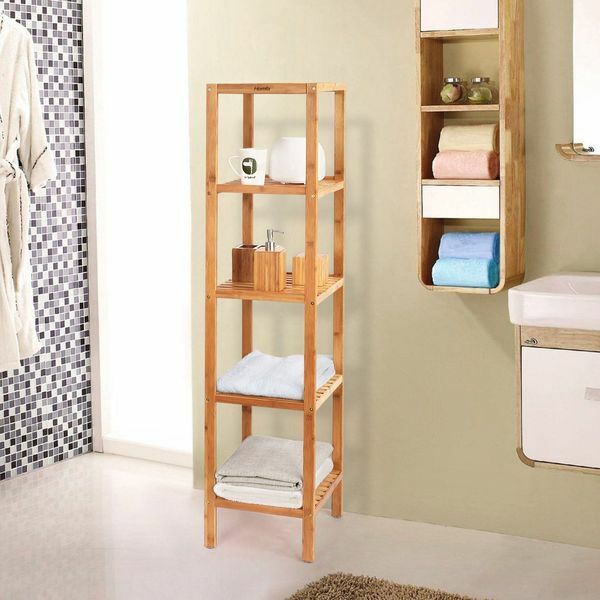 Neatly fold and store your towels within easy reach without creating an eyesore with this Bamboo Bathroom Shelf 4-Tier Multifunctional Storage Rack Shelving Unit. 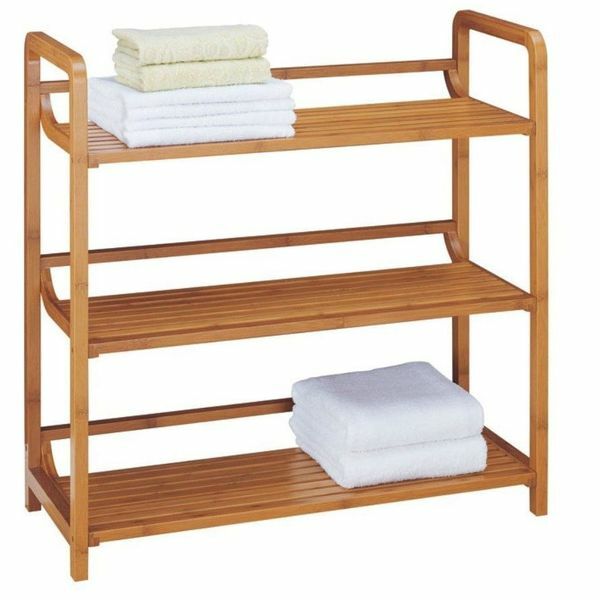 The bamboo storage unit features four tiers of storage for towels and any other toiletries you want to keep organized. 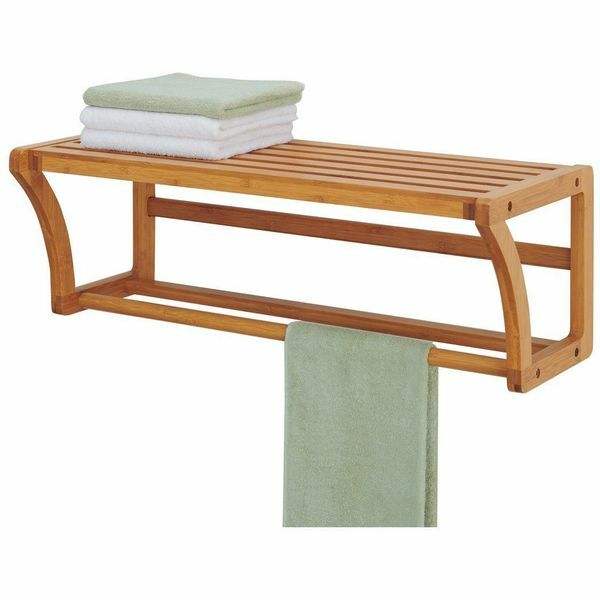 This big bamboo towel rack is actually a three tiered shelf. You’ll soon be hanging all of your towels, bathrobes, and additional shower time necessities inside this spacious deluxe model. Its big rectangular design and woodsy Asian feel makes it a model for the ages. You’d think Walmart would be all over this one, since it’s got “American job stealing quality” written all over it. Regardless, it’s a real beauty, and looks excellent sitting in your bathroom even as it’s stealing precious food from starving panda bear’s mouths. 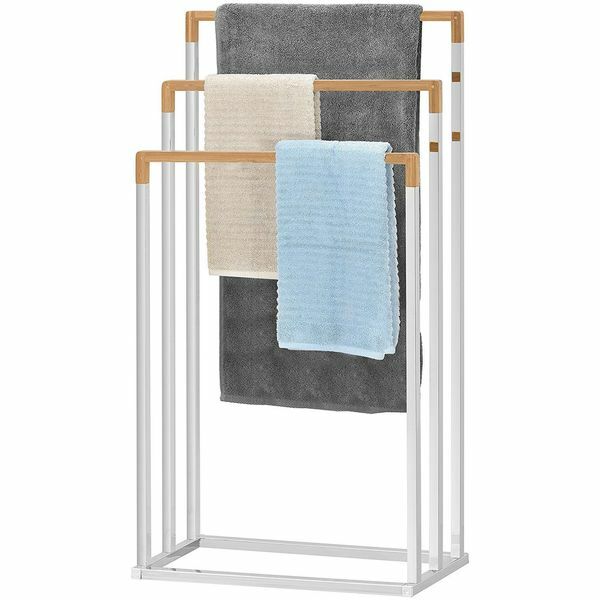 Store and organize your towels and toiletries within easy reach with the Bamboo Bathroom Shelf 5-Tier Tower Free Standing Rack. This rack features five tiers of storage, each made from sturdy bamboo that sits on a bamboo frame. The rack measures 13 inches by 13 inches by 57.6 inches in size.